Daryl Moorhouse: Hey, it’s Daryl here from a company called Tinpot Productions. We are a production company and recording studio based out of Dublin City in Ireland. 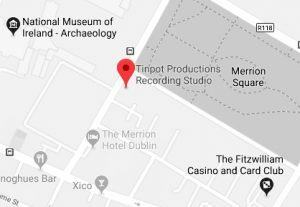 We are about to start doing something that we’ve been talking about doing for a long time, namely a podcast, the Tinpot Productions Podcast or Tin Pod for short. The idea behind this is it is conversations with the creative community. So we want to speak to a diverse range of people who are all have one thing in common and that’s producing media of some description. So that could be audio, video, online design, whatever it might be. We’re interested in talking to them about the production process, what’s involved and what they do and how they make stuff, how they started in the industry, where they see the industry going, the types of technology they use, those kinds of things. Daryl Moorhouse: We hope that that’s an interesting conversation, not just for us but for other people in the industry and in different disciplines or indeed people coming into the industry. So we’re gonna start pushing out episodes probably later this week. In the meantime, if you’d like to check out our new website, it is Tinpot.ie. So that’s about it. Thanks for listening to this very short introductory trailer. Hope you can join us when the podcast starts for real and talk to you then.